Click to expand and view full infographic. 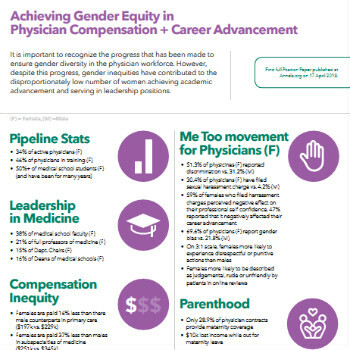 Promoting gender equity and eliminating the inequities in compensation and career advancement that physicians can face is a longstanding goal of ACP. As an organization, we are committed to addressing the unique challenges female physicians confront over the course of their careers in order to foster an inclusive environment that promotes growth and development for female physicians. ACP believes that addressing the barriers that women in medicine face is essential for the internal medicine community to benefit from the full potential of women physicians in the workforce. to help promote gender equity, giving ACP credit. This ACP position paper published in Annals of Internal Medicine provides a set of recommendations addressing the challenges women in medicine face, including equity in physician compensation, career advancement, and bias. This ACP research report highlights the differences in physician compensation by gender among U.S. American College of Physicians (ACP) internists. Published in Annals of Internal Medicine. Women in medicine-focused videos and webinars. A collection of resources to help physicians committed to addressing gender equity at the organizational level and individually.